As I was reading through this journal, I could not help but notice how many references there are to comics and graphic novels (I wrote about another article the other day that used comics in the classroom, too). I made a comic about it (’cause, well, that’s what I often do). In reading the article entitled Nontraditional Texts and the Struggling/Reluctant Reader, researcher Joan Fingon explores something I see a lot in my classroom: struggling readers (and mostly boys but also some girls) are more apt to dive into a graphic novel than they are with a traditional novel. I’m sort of lucky, as I review graphic novels for The Graphic Classroom and so, I often will get boxes of graphic novels and comics that I reads, let my sons read, and then I bring them to my classroom for my students to read. Fingon says her intent is to show how graphic stories might help level the reading playing field in a classroom for all students. Here, she focuses her research project on some English Language Learners who were reading, in particular, The Wimpy Kid series by Jeff Kinney. She documented not only engagement and motivation, but also vocabulary growth, processing of text and more. The hope is that graphic novels then become the launching point for readers into more complex text, although one could also argue that there are plenty of graphic novels that offer the “text complexity” demanded by the Common Core curriculum, too. That’s an important message here, and even if the connections made in the piece to my own concept of New Literacies is a little bit weak, the focus on struggling readers with non-traditional text is something we need to do more of, and just like the goal of technology that requires us as educators to explore ourselves in order to understand the possibilities of technology, teachers need to become more immersed in the medium of sequential art by reading graphic novels, comics and other non-traditional texts. The next step, which Fingon sort of hints at, is to bring the concepts of graphic novels to the students’ own storytelling and analysis, and help young writers see (and validate) the use of comic art as a storytelling device. Even with the shifts in the Common Core to more informational texts, there are plenty of webcomic sites and downloadable comic frames, that would allow more of our reluctant writers to showcase their talents and understanding in other ways than an essay, or a short story. Be open to the possibilities. 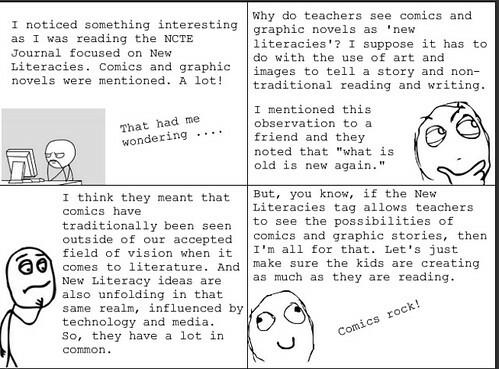 This entry was posted in comics, New Literacies Initiative. Bookmark the permalink.